For make money bloggers like me, it is very important to note down all the milestones I achieve because it is an indication that things are going forward. Sometimes, the milestone can be as big as achieving the first USD15K at PayPerPost or RM20K at Nuffnang. By the way, I have long surpassed the RM20K at Nuffnang but I have kept a low profile over it as those are taxable income. If you make RM30K or more in a year, you have to declare your taxes, ok? Sometimes, the milestone is just a baby step like making the first USD10. Big or small, it is good to pride ourselves so that we will continue to work harder to achieve bigger milestone. Today, I am going to celebrate the first time I make USD100 in a month from Chitika. 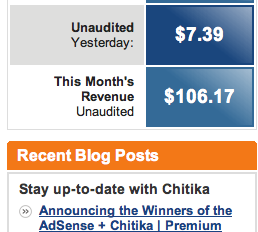 Since I installed Chitika Premium Ads, my ads income from Chitika has increased several folds. It is very encouraging and I hope this income will continue to increase in the coming months. The year is drawing to an end soon but I have yet to check the total amount of money I made online this year. Hopefully, when I have got rid of this flu that I am currently suffering from, I will be able to take stock and see how much I reaped from making money online. It is definitely less than 2007 and I hope 2009 will not drop further. u surpassed rm 20k long time ago..wah..now it’s really hard to make money from Nuffnang. 2009, will be a tough year..as more big company will decreased everything to workers to salary plus advertising expenditure.We just need to work harder. As for me, my company will start our big project next year, hopefully it will be a success. As you never know what will going to happen :). I remembered how excited I was to get my first clickbank cheque and first adsense cheque too. But I just joined chitika and still no earnings. LOL. Got to buck up more for 2009! Must we declare what we make if we earn less then 30k? hoho. everyone had different way to celebrate christmas.